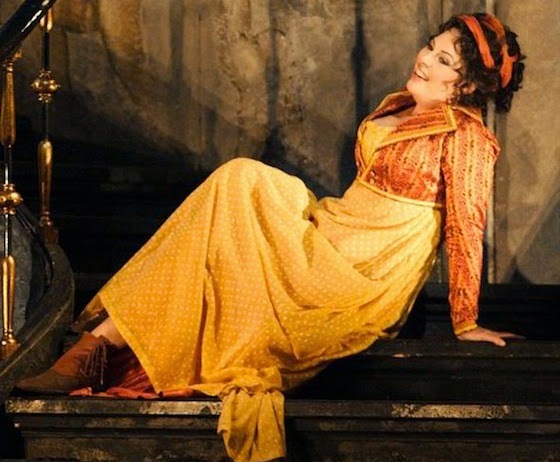 "In the title role, the American soprano Sondra Radvanovsky was quite stunning. Her voice has astounding power with thrilling high notes. 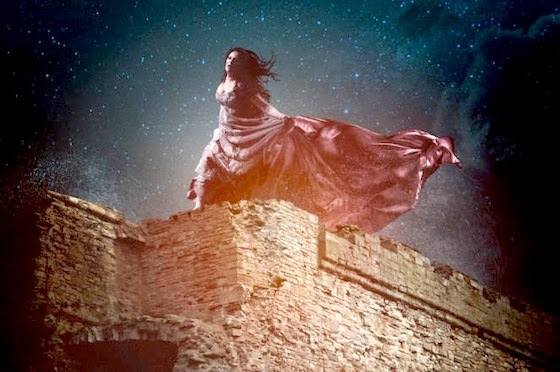 Her acting ranged from coquettish and suspicious with Cavaradossi to tragic when submitting to Scarpia, but was convincing throughout....Finally, there is Tosca's leap to her death. All too often, this is a tentative little step across the parapet, giving the impression that the soprano is a bit worried that he might sprain her ankle or chip a fingernail as she plummets to her doom. Claire Rutter showed us how it should be done at ENO a year or two ago, and Radvanovsky followed her lead with a wondrously graceful slow fall backwards. This was not just a good leap, it was a great leap, well worth an extra star on its own." [Source] For more information about the production, please click here. Also, after the jump, a wonderful marketing photo for the production that depicts the jump.